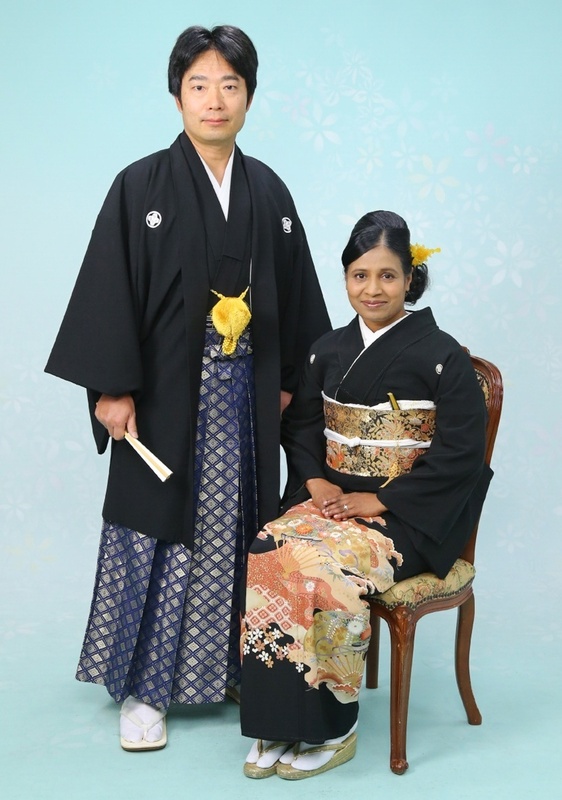 From 11th to 16th August, hubby and I had been to our home in Ichinomiya City during the Obon Holidays. Obon is an annual Buddhist event to commemorate our ancestors. It is believed that each year during Obon, the spirits of ancestors return to this world in order to visit their relatives. Traditionally, lanterns are hung in front of houses to welcome the spirits of ancestors, graves are visited, and food offerings are made at family altars. At the end of Obon, floating lanterns are put into rivers, lakes, and seas so that the spirits can return into their world. However the customs followed may vary considerably from region to region. Obon is celebrated from 13th to 15th August every year. On 11th August, hubby and I left our home in Yurihonjo City at 2 pm and reached Akita Airport after about 45 minutes of car drive. Our flight to Centrair Airport in Aichi prefecture was at 4.30 pm. After about an hour of flight, we reached Centrair Airport. While walking towards our connecting train, I noticed an advertisement board about ESCA underground shopping mall in Nagoya City. Seeing that advertisement, I was reminded of my doctoral work days about 2.5 decades ago back in Pune City in India. This is because the laboratory where I did my doctoral thesis work was acronymed ESCA. Some pleasant and some tough memories flashed back. Anyway, afterwards we took Meitetsu Airport Line train and reached Ichinomiya Railway Station at about 7 pm. My father-in-law and his wife were waiting for us at the station and we all directly went to a Japanese-style restaurant named Namazuya to have dinner. We all had set meals of Unadon, which is a bowl of rice topped with fillets of grilled eel. The food tasted delicious. We all chatted while eating and had a nice evening. Finally we reached our home in Ichinomiya at about 9 pm. We were rather tired due to all the travel, and went to bed immediately. On 12th August, father-in-law, his wife, hubby, and a few other relatives went to play golf at Springfield Golf Club in Tajimi City of Gifu prefecture. They left home at about 6 am. I am not at all interested in golf, and so I preferred to stay at home and relaxed in the morning. In the afternoon, I cleaned our home and watched some local television programs. At about 3.30 pm, hubby returned home after playing golf. Afterwards we cleaned a tiny garden in the backyard of our home. We had started the garden in May 2014 but since we usually do not stay in our Ichinomiya home, almost all plants had dried up and many weeds had grown in the entire backyard. So we weeded, pruned, and cleaned the garden as well as the backyard for about two hours. It seems that tending to the garden was very therapeutic and relaxing for hubby. It was dusk when we finished working in the backyard garden. At about 7 pm, my father-in-law, his wife, hubby and I had dinner at a Sushi chain restaurant named Sushiro located near our home. 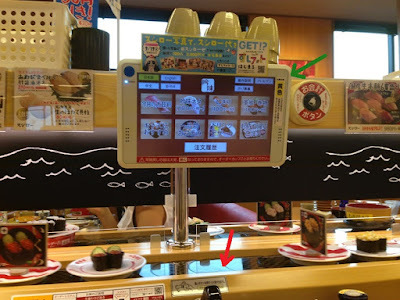 We noted that many Sushi dishes were placed on a rotating conveyor belt that wound through the tables at the restaurant. So we could easily pick up which ever Sushi dishes we preferred to have. However, if some dishes were not available on the rotating belt, we could order those dishes via tablets placed at the tables. These two ways of serving has almost eliminated the need for human waiters. We all had various kinds of Sushi dishes and had desserts too. The food was delicious. On the morning of 13th August, a few relatives, hubby, and I visited the home of my father-in-law’s eldest brother who lives near our home in Ichinomiya City itself. In fact, it is the main ancestral home of ‘Nagata family’. There is an exotic family altar at this home, where father-in-law prayed to welcome the souls of his late parents and all the ancestors. We all recited Sutras from a sacred book and prayed at the altar. 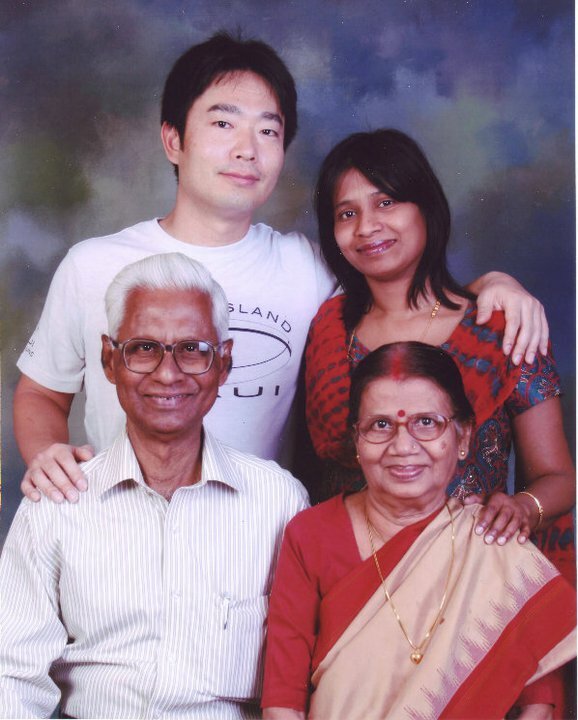 Afterwards, we all had a nice time chatting with hubby’s eldest uncle and his wife over snacks and cups of green tea. In the afternoon, hubby and I went to a nearby shopping mall named Kisogawa Aeon Mall to purchase a few household items. It was peak of summer season and we were very tired after walking around in the huge mall for almost 1.5 hours. So we cooled ourselves with cold mango and passion fruit juice. After shopping we returned home at about 3 pm. Soon afterwards a family-friend couple visited my father-in-law and his wife. Since father-in-law’s home is interconnected to our home, hubby and I also visited them and chatted with everyone for about two hours. We had a nice time playing with the baby daughter of the family-friend couple. The baby is so cute. In the evening we all had dinner at a nearby Chinese restaurant named Kyonkyon. We enjoyed having good food with friends and family. On the morning of 14th August at about 7 am, father-in-law, his wife, and hubby again went to play golf in Tajimi City of Gifu prefecture. I just watched some television programs and relaxed the entire morning at home. In the afternoon, I cleaned and polished several brassware items. It took several hours to polish and everything looked so shiny afterwards. At about 7 pm, hubby returned home tired but very happy after playing golf the entire day. Afterwards we had a simple home-cooked dinner. On the morning of 15th August, hubby and I visited my late mother-in-law’s grave located near our home, and offered our prayers. Hubby cleaned the gravestone with water, offered flowers, and lit some candles and incense sticks. In the afternoon, we visited hubby’s aunt Tatsu-chan in Okazaki City of Aichi prefecture. Tatsu-chan, my late mother-in-law's younger sister, has been a source of great influence and important fixture in hubby’s early childhood and teenager years. We were visiting Tatsu-chan after almost 4 years and were very excited about the visit. Tatsu-chan’s home is located about 75 kilometers southeast of our Ichinomiya home and it took us about an hour of train ride by Meitetsu Nagoya Main Line train to reach her home. During the train ride we were sitting in the front compartment and were a bit surprised to see a female driver because it is still very rare to find women in many fields of work in Japan. So I clicked a photo of the female driver for the sake of memories. We reached Tatsu-chan’s home at about 3 pm. 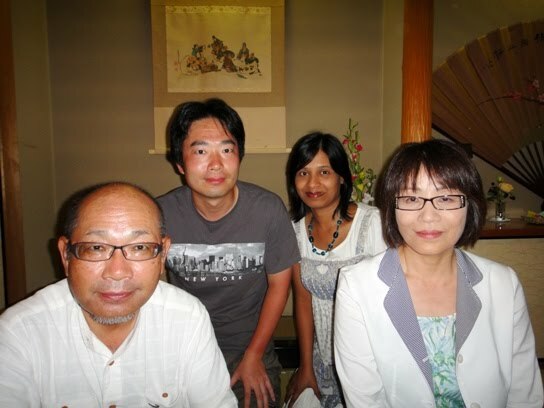 As always it was a pleasure to meet Tatsu-chan and her husband. We had a lot of catching up to do and we chatted for about two hours over evening tea and snacks. We returned to Ichinomiya City at about 6 pm, and soon afterwards went to a Japanese-style restaurant named Yasuke-zushi for dinner. Father-in-law, his wife, hubby’s sister and her family also accompanied us for dinner. Yasuke-zushi is a multiple course high-end restaurant that deals with Sushi and sea foods. We all enjoyed having various courses like Sashimi, Sushi, grilled fish, steamed clams, and a few other sea food dishes. We grated the Wasabi stems ourselves, and it was so much fun using a large amount of the pungent condiment over Sashimi pieces. We chatted and loved having the dinner around a round table. We all had a very nice time. While returning home after dinner, my sister-in-law’s both the daughters accompanied us and they stayed overnight with us. Both the nieces played card games as well as Shogi games with their uncle for some time. At 9.30 pm, the nieces took bath and soaked in the bathtub for quite some time. They looked very relaxed afterwards and again played with their uncle for about an hour. The girls were too sleepy and fell asleep by 11.30 pm. The next morning on 16th August, I made breakfast and fed the girls. Later my father-in-law drove them to their home. Hubby and I were to return to Akita that day itself, so we packed quickly and left our Ichinomiya home at about 12 noon. We took a train to Centrair Airport, and then a flight to Akita. We reached Akita Airport at 4 pm and our home in Yurihonjo City at about 5 pm. We had fun-filled Obon holidays with relatives and family-friends in Ichinomiya City.